Last week I was asked to present an after school session for Elementary teachers on new innovative tools to engage students. Unfortunately, the reality of most schools is that access to technology is limited. Often, schools only have one computer lab to work with (often over booked and impossible to get to on a consistent and regular basis). In addition, every teacher comes with their own individual skillset and level of technological prowess. So, the goal was to…. I planned a differentiated approach, due to the limited access, with a possible by all focus. Good for differentiation. In essence, I designed a “You already do this, so why not try this” focus. This also fits with the concept I was introduced to at #iste2010 in Denver, CO: SAMR. 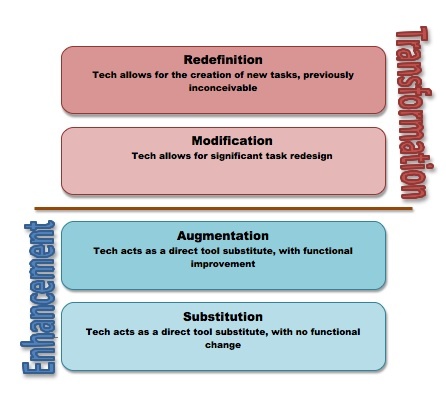 The SAMR model (Substitution, Augmentation, Modification, and Redefinition). When first initiating something new, the best practice is to substitute an existing tool or idea with a new one. Following that, the product could be augmented with a functionality previously impossible with the previous medium or tool. With that idea in mind, consider the following Web 2.0 tools / Online Software and their associated learning goals / outcomes. Check out Dr. Ruben Puentedura’s blog and podcast series, As We May Teach: Educational Technology, From Theory Into Practice – http://bit.ly/fe7V4q. More on the Maine Learning Technology Initiative can be found here – http://maine121.org/. All of these ideas can be facilitated in a station based approach – no need for whole class participation.